In today's IT market everyone strives for cheaper, faster, better and happier and preferably all at the same time. Cheaper for a better business case, faster for a shorter time-to-market, better quality to reduce future cost of maintenance and support and happier customers and team members. But how do I get there? How do I find the bottlenecks in my organization that stand in the way and what are we going to do about them? These questions are answered by Agile methods like Scrum, XP and RUP. Since each of these methods has a specific view on the IT world however, they all answer these questions in their own particular way. Where Scrum focuses solely on team organization, XP focuses mainly on day-to-day specialist practices for maintaining stability and RUP provides a complete iterative IT development lifecycle. This means that selecting one single method for IT development — although easiest to communicate to the organization — isn't always the best way to go. A blog platform for questions, discussions and sharing of experiences. 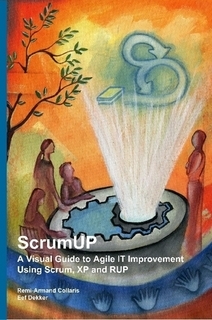 In ScrumUP, the authors bring together their experiences in IT improvement. Seemingly effortless they bridge the gap between methods and show how they can enhance each other. The visualizations in this book make it easy to read. They show how these methods relate to one another and how they help the team improve their way of working.